"Knowing Your Faith" is a program designed to work with the OCEC textbooks from grades K through 5. A minimum number of prayers, icons and content questions have been chosen from each text for the children to know. With repetition, these objectives can be met and progress can be made in the religious education of our youth. Parent and teacher letters, and teacher aids are included. 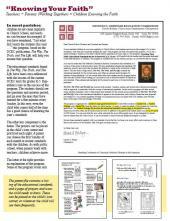 Click on each link to download a PDF file that may be viewed online or printed. Adobe Reader is required to view PDFs. Download Adobe Reader here. In the Grade 5 Teacher Package, the icon for the feast of the Exaltation of the Holy Cross should list the dates as September 14/27, instead of 8/21; and that a replacement page is now available.